The Mecca Center held an Interfaith Solidarity Prayer on Tuesday, March 19 for our Brothers and Sisters in #Christchurch New Zealand who were victims of terrorist attacks at two masajid (mosques). The service began with community members offering Maghrib (sunset) prayers. 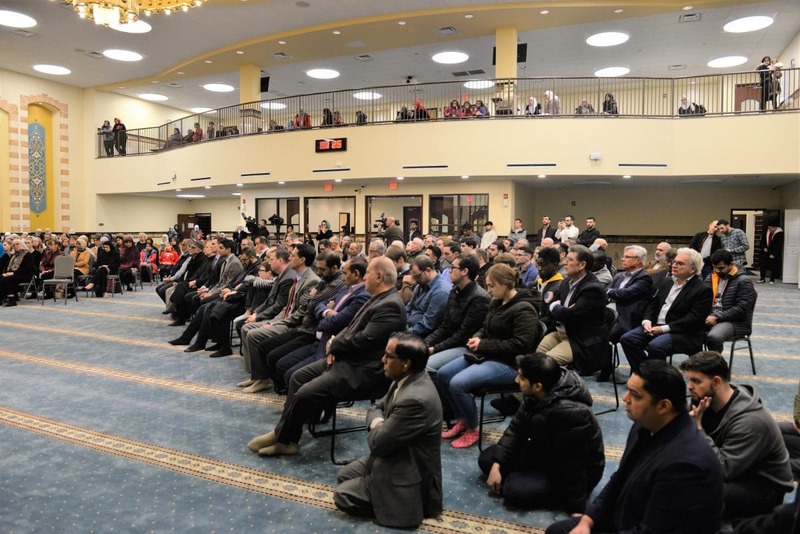 Sheikh Hassan Aly, Imam and Religious Director for the Mecca Center, welcomed and thanked guests for attending the service and began by reciting verses from the Quran (Chapter 2, 153-157), which urges believers to practice patience during great times of calamity. In memory and prayer, individuals representing many faith and civic organizations followed by reading the names of the victims in Christchurch. The speakers included Mecca Center community members Rana Awwad, Omar Sibai, and Dea Ajdini, Dr. Christi Billups – Professor at Lewis University, Pastor Rhonda Kral from Gloria Dei Lutheran Church in Downers Grove, Priest Father Toni Josevski from the Macedonian Orthodox Church, Pastor Bromleigh McCleneghan of the Union Church of Hinsdale, Rabbi Ricky Kamil from Congregation Etz Chaim in Lombard, Carol Cartwright from the Hinsdale United Methodist Church, Dr. Scott Alexander from the Catholic Theological Union, Dr. Asra Ali from the Islamic Society of North America (ISNA), Dr. Lanny Wilson of the Redeemer Lutheran Church, Savannah Rucker – a senior student of Psychology at Lewis University. Dr. Zaher Sahloul – former Chair of the Council of Islamic Organizations of Greater Chicago (CIOGC), and Susan Krawczyk from HCS Family Services.